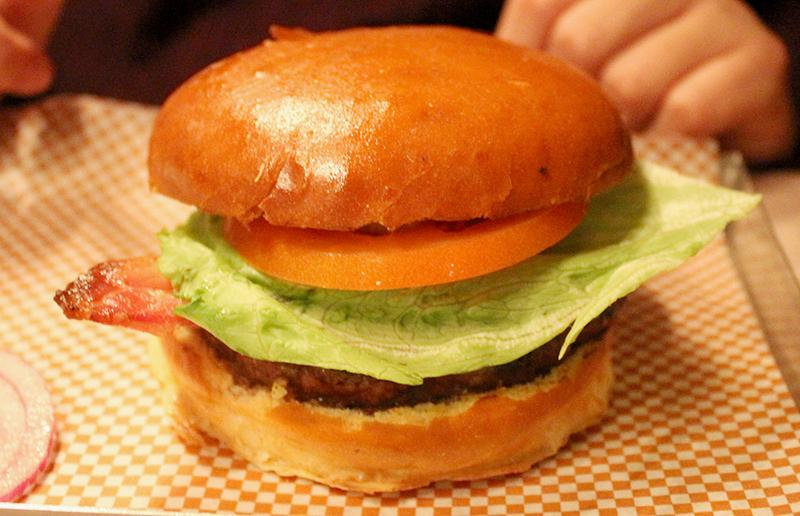 There’s burger joints popping up all over London, so what allows BRGR.co to stand out in a crowded market? Whether you fancy a high-end crocodile burger or a quick takeaway bite, there’s a burger for everyone now. So it’s time we start thinking about more than just the meat. Or is it? BRGR.co was established in 2010 and offers tasty hot dogs and burgers, offered in three different meat cuts. The chain which has a venue in Chelsea and Soho, features the choice of three different meat cuts Blade, Hanger and Rump, at different price levels. For those in the know, ignore this bit… But, if you weren’t sure (like us) here’s the breakdown. Burger lovers take note! The Blade cut is from a muscle in the beef chuck primal cut, specifically the top blade (or infraspinatus) muscle, which is part of the chuck shoulder clod. The Hanger is known for its flavour. This cut is taken from the plate, which is the lower belly of the animal. Finally, the Rump is the most succulent of the three, Rump comes from the rump primal, largely equivalent to the American sirloin and features Flank and Fore rib. All their 6oz burgers come from grass-fed cattle in Scotland and are served in toasted demi brioche buns accompanied by iceberg lettuce, beef tomato, red onion and sweet pickled gherkin, which is served on the side off the burger, allowing you to build your own, and leave out what you don’t want. A nice touch, we felt. Of course, there were plenty of condiments ready for your burger’s every need. It’s also good to note all burgers can be served without a bun and with a salad garnish at no extra cost- plus gluten free buns are also available. Choosing from their menu, we picked the cheese and bacon to dig into with rump meat, coming in at £15.45 per serving. A hefty cost for a burger, with no sides – we must add, but is their best cut of meat on offer. There’s a good range of drinks on offer too, from home made iced tea and lemonade, to flavoured and ‘hard’ milkshakes. 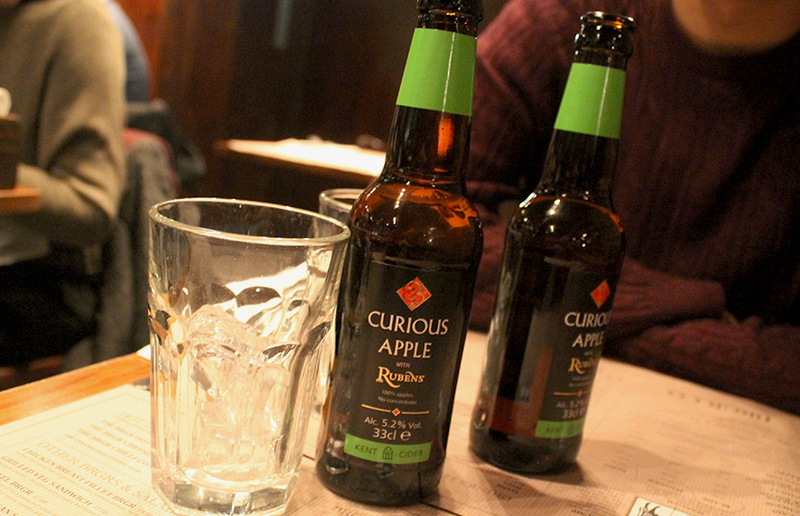 We opted for the Curious Apple with Rubens Cider, which had a refreshing sharp bubbly apple taste. Our server Alex was wonderfully helpful, and took us through the menu answering any questions we had, plus offering his advice and recommendations. Having a genuine interest in us and the food they sold, Alex ensured we felt looked after – and that it wasn’t just a quick in and out, of as many customers as possible. Something we had no problem deciding on was the sides. There’s a great selection of sides with all the favourites on offer – something that’s hard to find in one single place. Where do we start? Well, fries were aplenty, with crunchy fries, cheese fries, cheese and chilli con carne fries, and parmesan truffle fries all on offer, plus the old favourites sweet potato. Onion rings, homemade coleslaw and side salads are also on the menu. We opted for the cheese and chilli con carne fries – which came with a generous helping of chilli, which Ethan swiftly demolished. 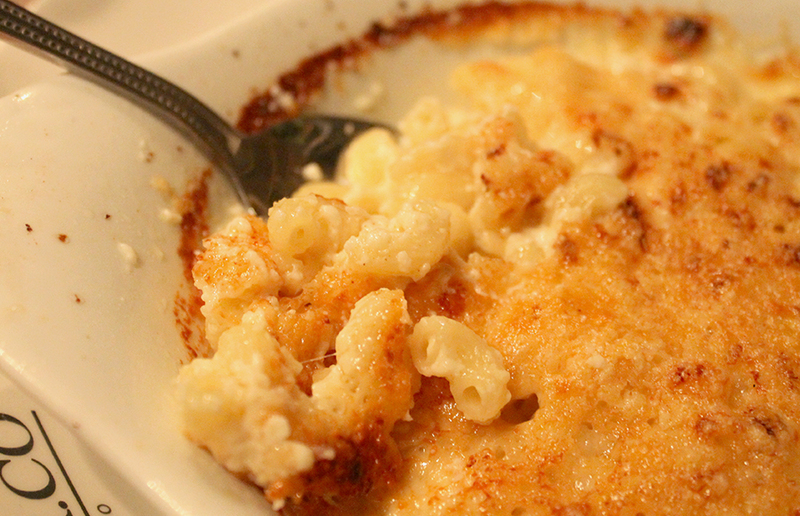 It would have been rude to resist their mac n’cheese too, which was deliciously creamy (available as regular or spicy). Portion sizes were great for sharing, big enough to share between at least three. 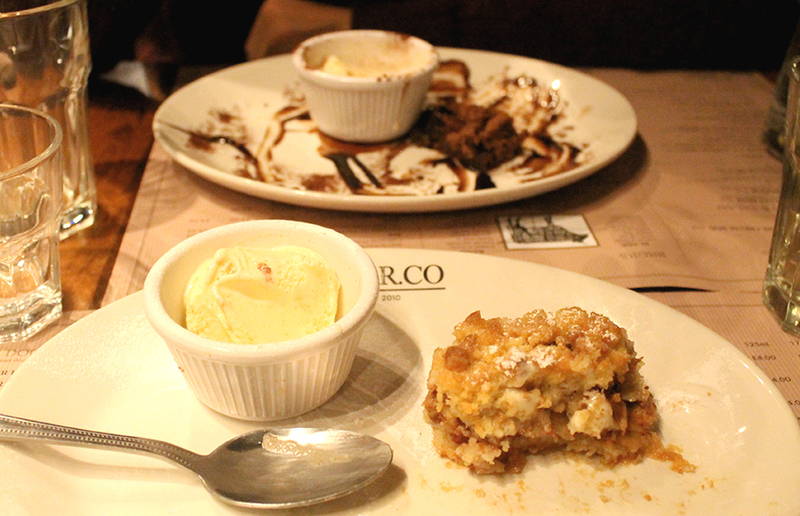 We finished off with some desserts (both with a helping of vanilla ice-cream). I opted for a beautifully flavoured Apple and Banana crumble, which almost had a banana bread-like consistency on the bottom, mixed with a good amount of cinnamon (which we love). The whole item was a refreshing change from what can sometimes be a poorly made crumble, or oaks topped mix. 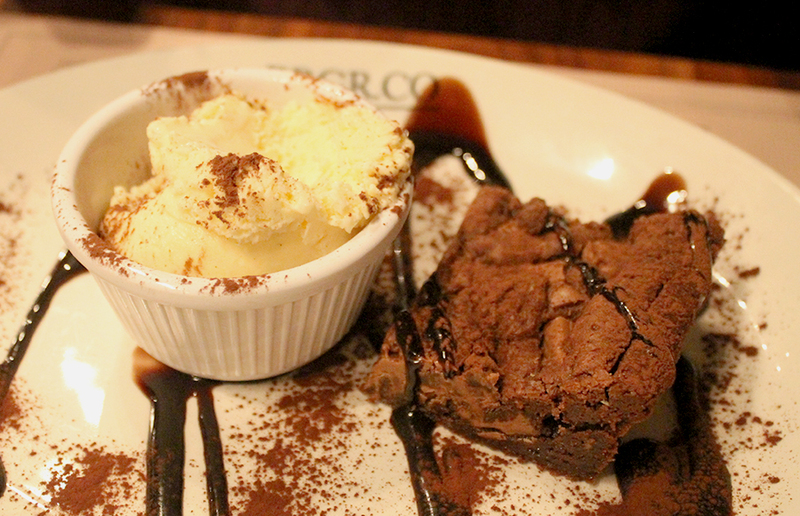 Ethan, of course, chose the warm chocolate brownie. Needless to say, it was the perfect end to a great meal. The brownie had lots of chocolate pieces mixed into the slab, and the chocolate sauce on the plate was a great dipping sauce. The dessert selection, whilst small, has something for every pallet – and you can choose from cream or ice cream to add. Overall, we would definitely return to BRGR.co. The atmosphere is friendly, the food is good quality; ideal for a chilled out dinner. Plus if you’re quick you can go and check out their new ‘Burns BRGR’ which is made up of a Scottish Blade Steak patty topped with grilled haggis and whisky ketchup. If you are popping in, don’t forget to snap your food & tag the brand for a free shake or dessert next time you dine with them! You can visit BRGR.co in Soho at 187 Wardour Street, W1F 8ZB and Chelsea 127 King’s Road, SW3 4PW.